Catarina Alberto, a farmer in the Ruace region of Mozambique, is part of a program which is helping to build a sustainable soy industry in Mozambique and Zambia. See how our Soy Value Chain Development Program has improved Catarina's life and the lives of those around her. Catarina Alberto, a farmer in the Ruace region of Mozambique, is part of TechnoServe’s Soy Value Chain Development Program, which is helping to build a sustainable soy industry in Mozambique and Zambia. Catarina has grown soy for the past eight years, starting with 2.5 acres of land. She now has 10 times that amount. With the profits from soy, Catarina has built a house and bought a motorcycle, two bicycles and a television for her family in the past four years. 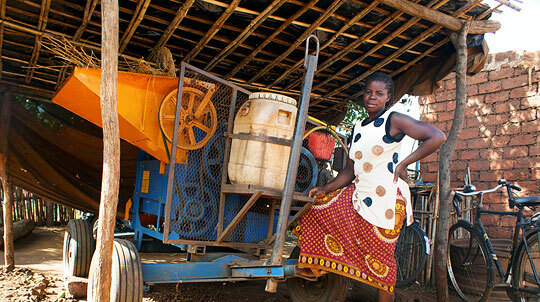 She also bought a dehulling machine, pictured above, that she plans to use for her crop and those of neighboring farmers. Today, Catarina is one of the smallholder commercial farmers who are responsible for soy seed multiplication in Mozambique. TechnoServe is helping to create a market for Catarina’s seeds, which are distributed to farmer organizations and agribusinesses, and eventually to other smallholder farmers. Learn more about TechnoServe’s work with soy in Mozambique and Zambia.